NOTE: These guidelines are a work in progress and will be updated as soon as additional details are finalized. Letterhead and envelope templates are provided at the bottom right of this page. The business card template can be found here. Please do NOT create your own versions of these items. All marketing materials are a representation of the University and its brand. Your assistance in maintaining this brand identity is crucial, and we rely on you to assist in introducing our new brand to the public successfully. The Office of Marketing, Communications and Alumni Relations MUST APPROVE ALL marketing materials to ensure the most current branding and logo usage guidelines are followed. 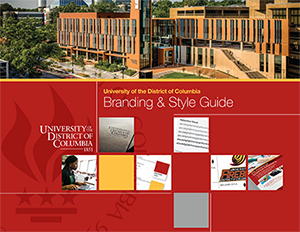 For approvals or if you have an immediate need that these guidelines do not address, please contact Jay Morrow at jmorrow@udc.edu, 202.425.5379 or 202.274.6253. Please email udc-communications@udc.edu to request current logo for official usage. UDC’s official logos can be downloaded here: Click on the horizontal or vertical logo image below, depending on which orientation you would like to use. A .zip file containing all versions of that orientation (print EPSs, Web, JPGs, PDFs) will be downloaded. After downloading, double click on the .zip file to decompress and access the folder containing all the logo files for the orientation you selected. Do NOT use any of the previous versions of the logo; they are now outdated. The Presidential Seal is reserved for the Office of the President only and should not be used on general marketing materials. UDC now has official college logos that can be downloaded below: Click on the college or school name of the logo you would like to download. A .zip file containing all versions of that logo (print EPSs, Web, JPGs, PDFs) will be downloaded, you may need to specify where you would like to save the files. After downloading, double click on the .zip file to decompress and access the folder containing all the logo files for the college or school you selected. UDC now has an official Foundation, Inc. logo that can be downloaded below: Click here or on the image below. Use the same download instructions as noted above for the college logos. ALL logos (UDC and Firebird) must ALWAYS be placed with a fixed proportion of height to width. Do NOT stretch them wider/horizontally or taller/vertically. Scale each logo proportionally ONLY, i.e., with height and width percentages of the original logo size being equal (e.g., 90% width and 90% height). Minimum requirement for open space around the official UDC logo: Depth of open space around the logo should be equal to or greater than the X-height, which is the height of the capitol D in District. A diagram will be provided soon showing the amount of white space around the logo. Minimum size of the official UDC logo: Ideally, 2.5˝ wide, but it depends on the situation/layout. 1˝ wide for promotional premiums (e.g., pens, sticky notes, small items). The logo should not span the whole width of the page, but it should stand out predominately over the other elements. Most importantly, ALWAYS ensure that all text in the logo is legible at actual size. The following are the official color breakouts for printing on coated paper and for Web applications. Layouts should be predominantly based on these colors or white. Printed marketing materials: Helvetica Neue or Sabon (in all of their variations—Roman, bold, italic, etc.). Trajan Pro is the new display font for headlines or decorative elements like quotes; it will replace the previous fonts: AUBauer and Schniedler Initials. It is used for The Flame products in the masthead and headlines. Web pages and on-screen presentations: Arial or Times Roman (in all their variations—Roman, bold, italic—EXCEPT condensed). These fonts may also be used for the body of letters and for internal communications. NOTE: Most marketing materials will be created and produced by external vendors, and it is their individual responsibility, by copyright law, to purchase these fonts. The University name should NOT be written/spelled out additionally next to the logo (unless completely unavoidable and with approval of the UDC marketing department). Do not put the logo in a box. The old “boxy” style of the logo is no longer acceptable. Also, the bars and stars are no longer part of the UDC brand identity and should not be used as graphic elements. The star may be used as a small bullet only (font: Zapf Dingbats, key H). Do not place the logo over a busy illustration or photo. All parts of the logo must be clear and legible.